A pleasant day for once, just one shower, and getting warmer at last. We had a goodly gang together, and spent the day at Toddington south finishing off the second of the two turnouts there. The day started with a hissing sound behind the mess coach - what's going on here then? 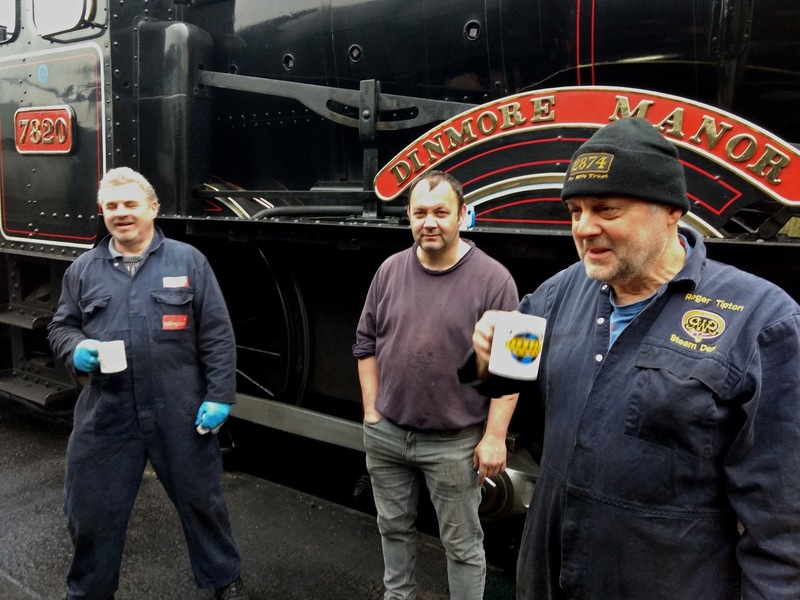 Dinmore was raising steam, and 2807 was being used to serve tea. Great ! These are the fire raisers (hell raisers?) 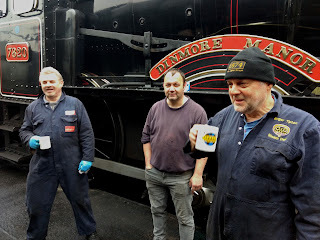 for Dinmore Manor, and it is thanks to them and their getting up very early indeed that you might have travelled behind steam today. The Pway had their mess coach, with seats to sit down on. And doughnuts. So civilised. But eventually we had to abandon the coach and face the work. 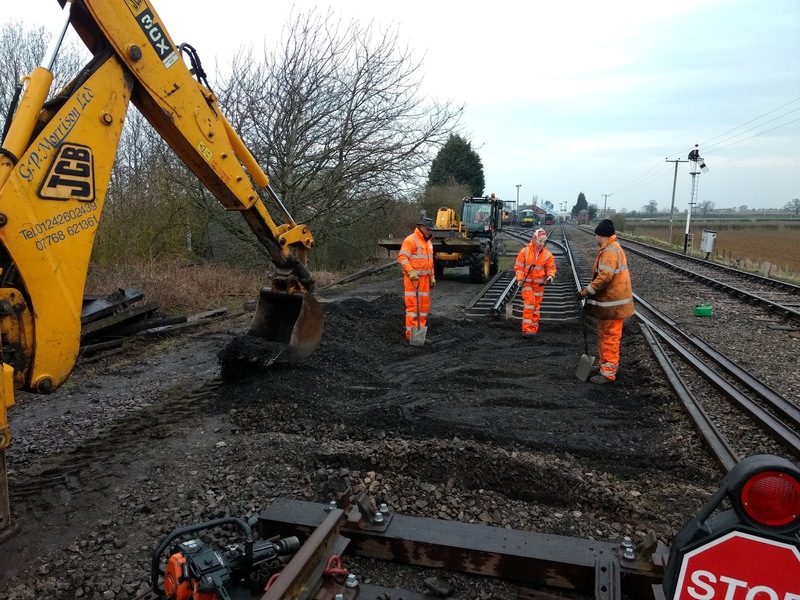 Last week we decided to give this short panel of plain track some stronger, concrete sleepers. 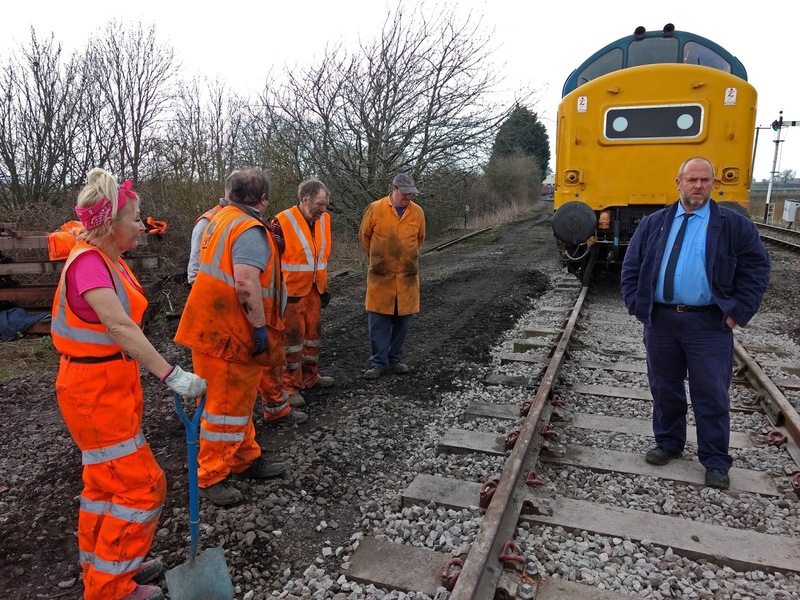 We might as well, we are there, we saw a dozen spare concretes lying about, and the few wooden sleepers here looked poor. We tipped out the rails. 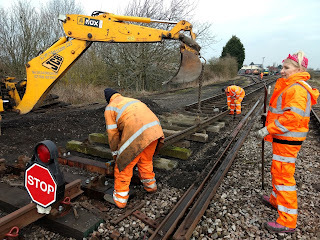 Steve the scraped the bed clean of 'ballast'. This must date from the earliest days, as it was all ash and occasional stones, with a big dip where the fishplate was. And yet, locos exiting the yard travelled over it every day. 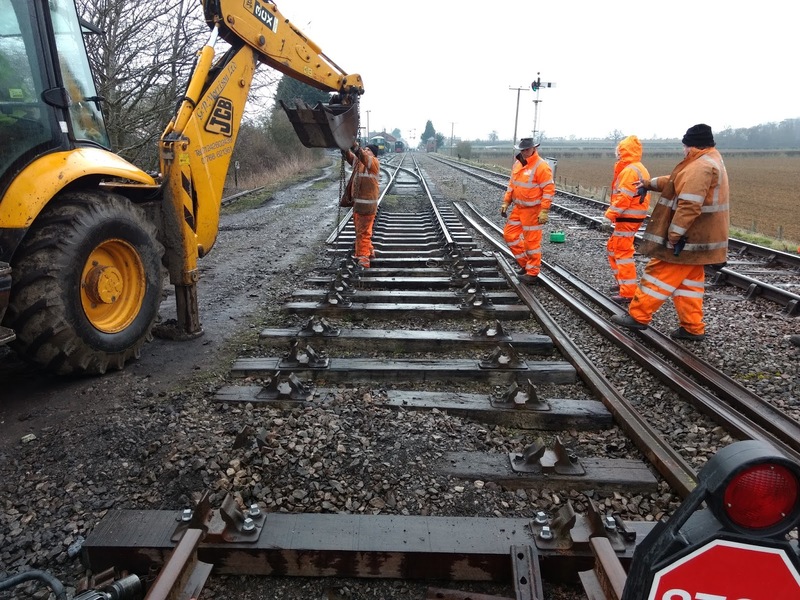 We'll sort this out OK.
Then Steve went to get the spare sleepers we found lying about. Some in the loco yard, and some in the bushes nearby. Not the finest quality, but good enough for loco manoeuvres, certainly better than the spent wooden ones that were here..
A quick pause for the first train of the day to pass. Our second new turnout is in the foreground, it's almost finished now. New rail on new sleepers, this turnout will take anything. After the concretes have been laid in we straighten them up, and then put the rail back. It's only a short length. 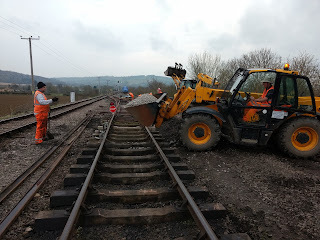 You're going to say, that stop board is in the wrong place, but we work so quickly that this bit will be finished before any more locos come out of the yard to play. 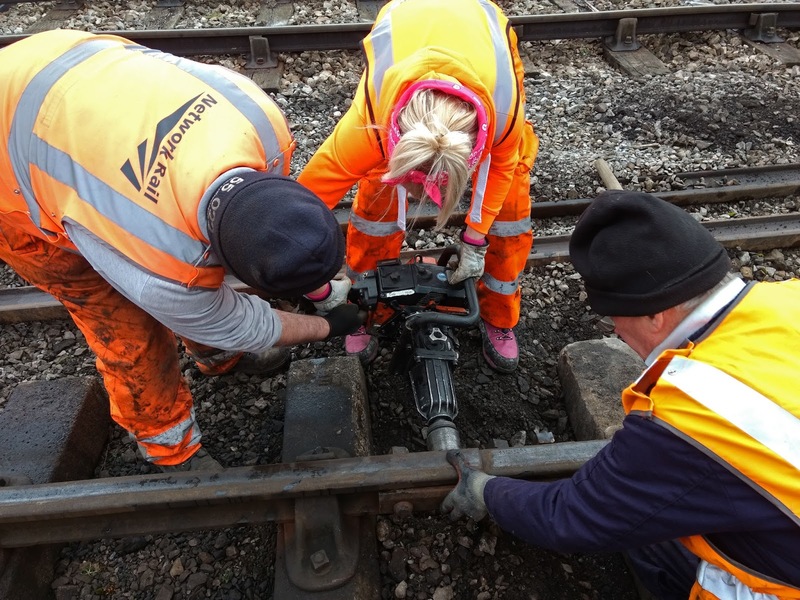 Our new husband and wife team join John and Bert Ferrule in fishplating the rail just put back into place. Another stop to let a service train go by. This time it's 2807, the heavy freight. Rods down too, a photographer's ideal. Thank you, driver ! The smartphone camera though is playing up again. While it does not have issues with dirt getting into the retractable lens (there isn't one) software issues now arise. See how the front buffer beam didn't make it into the picture? You activate the shutter, and the camera goes: 'Ah, did you want a picture now, I'll just calculate that'. And when it has finished and finally clicked, the subject has moved on. Bad luck. 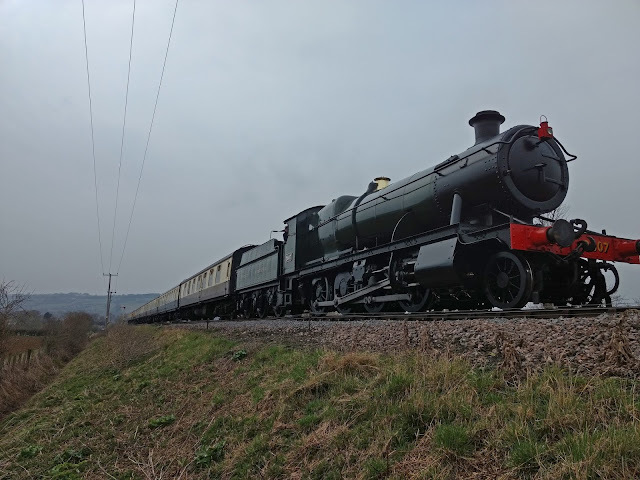 On top of that the zoom function was lost today, hence a bulging loco in the default wide angled lens shot. It took your blogger all day to work out that Google had sent a software update to the camera, and changed the way the zoom operates. And now the camera crashes every time you take a picture. Sheeessh ! 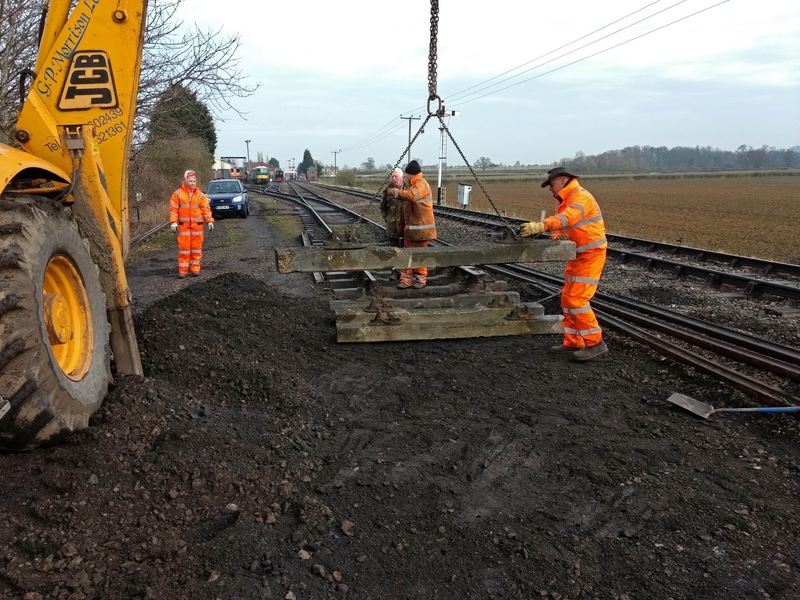 During the day both Alan and Stevie brought supplies of ballast, which we shovelled into and under the sleepers. Hard work for retirees! Stevie also brought ballast, from a pile he 'prepared earlier'. Not such a long trip, but together he and Alan (his pile was in the car park, not helped by a passenger parking his motor home too close) kept us well supplied. 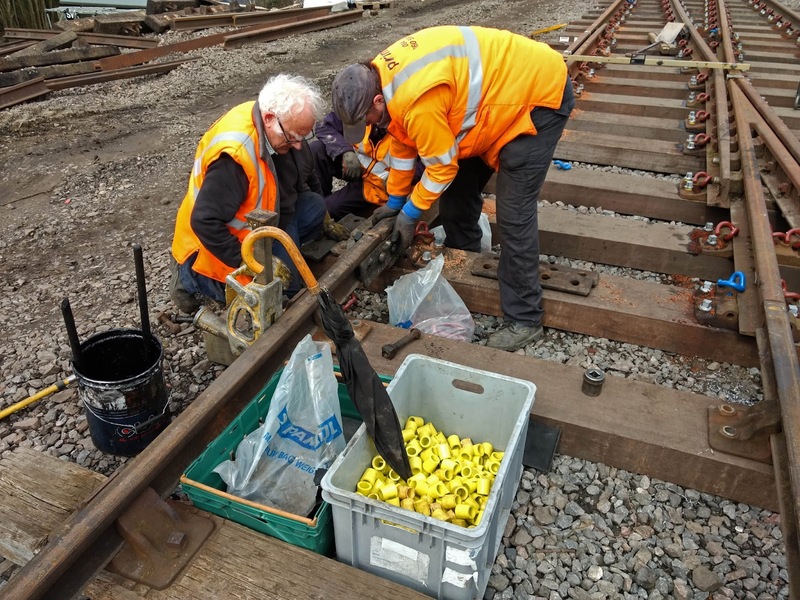 Before we put too much ballast in, we had a quick 'tweaking session' of the short length of rail to make sure it was nice and straight. Bert's hand says: Stop! Enough already. Then we put back the fishplates using the 'Animal'. This is a somewhat back breaking machine, so we let everyone have a go. 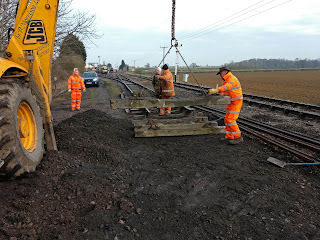 Here's the fishplate going on at the other end. We like the umbrella stand. With the rails back in place and joined up, Stevie dragged away the longer bullhead rail that used to be here, until we put the new turnout in. 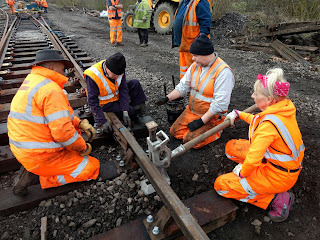 The old headshunt siding was already connected up, and we spent a brief moment packing the end joining the turnout so that there was a gradual slope back down. Sleepers not brilliant here, OK, but 'it's only a siding'. 2807 back from Winchcombe, on its way to 'Return to Broadway'. We saw lots of faces at the windows, good news. 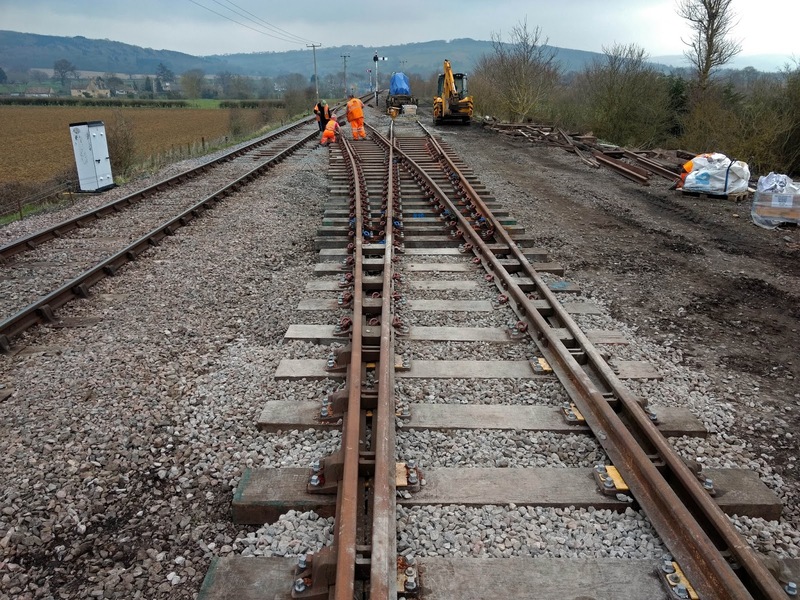 In the foreground the short length of rail, just resleepered, has also been ballasted. Looking good. Did we mention that today we did a lot of shovelling? This is 'hand packing', using shovels to move ballast that is designed not to move. Very hard work, you need a bit of youth around here. 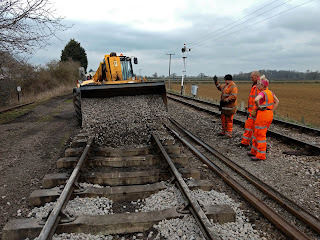 Our new bit of resleepered track was tested mid afternoon by 37 215. Why not something really heavy to see how well we packed it? 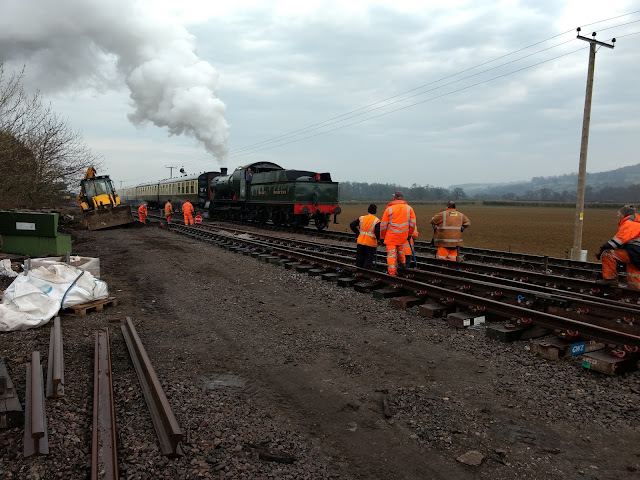 The loco was on its way to take over the last train of the day from the 'kettle'. The driver and second man got down to inspect our fishplate. Did it pass muster? A picture says 1000 words.... The rest of the gang stand by, hopeful. Here's our end of the day picture. All the metalwork in both turnouts is in, we have basically done it. Looking pretty good, no? 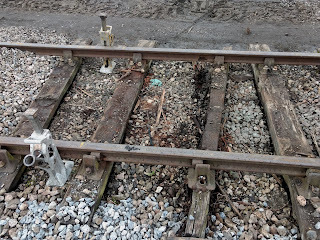 There is still a gap in the middle that needs filling with ballast and hand packing some more. Stretcher bars need fitting at this end, and the point motor and operating levers need fitting. We felt we were allowed a treat. ''I'm going to start singing now''. ''Please don't''. 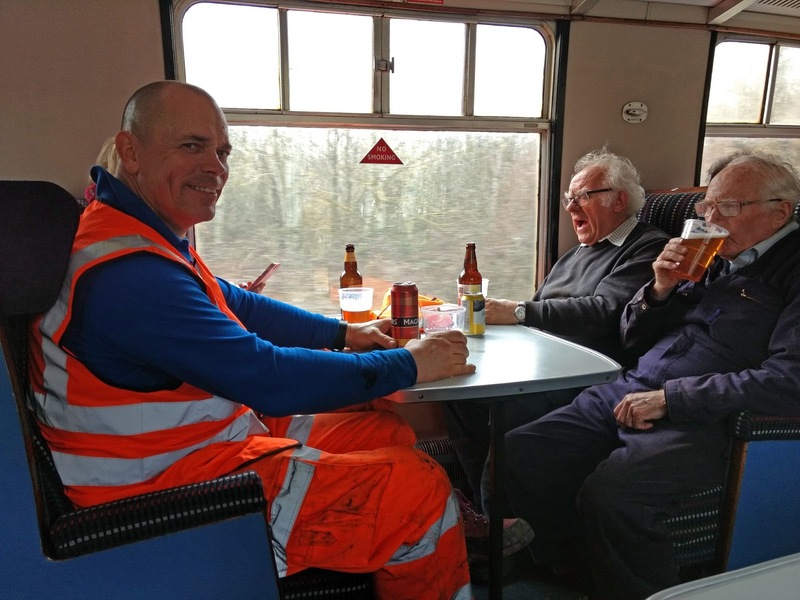 We packed up our tools, and decided to take the 16.00 from Toddington to Broadway. Why not? We have never been on a public service train along the line we built. Go on, then. Also a chance to try out the special Return to Broadway ale brewed for us. Did you know? Its tasty, and 4.7% proof, so just the one bottle. Treat yourself when you come down. A bit of Broadway news. A little round up of stuff seen at our new station. 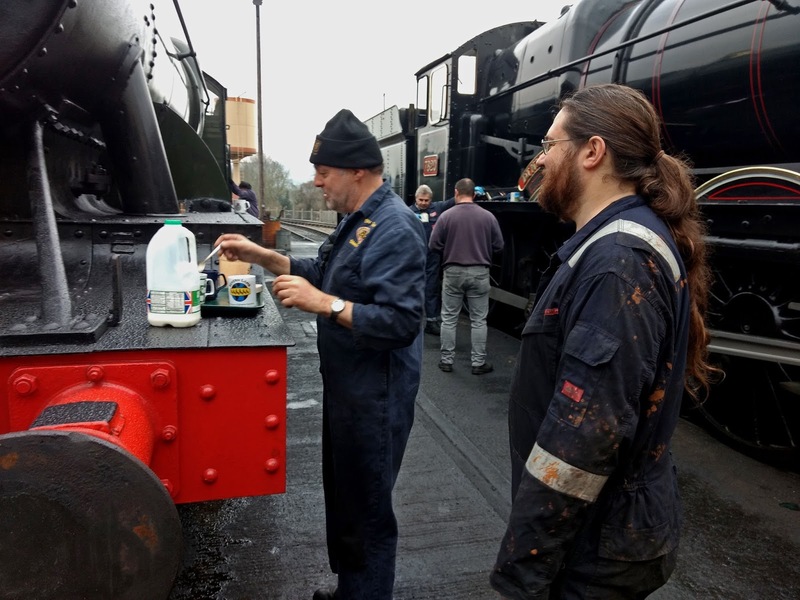 The stationmaster today said people love it, she got lots of compliments. Every train, we heard, was well filled. Given that we haven't got a car park yet, some useful new signs have been put up to direct passengers to where they can park, and then walk to the station in about 10 mins. There are two GWR lamp huts at Broadway. 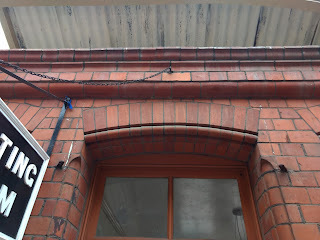 One is as is, with this 'works plate' on the door. The other was re-skinned in the early days of the project. 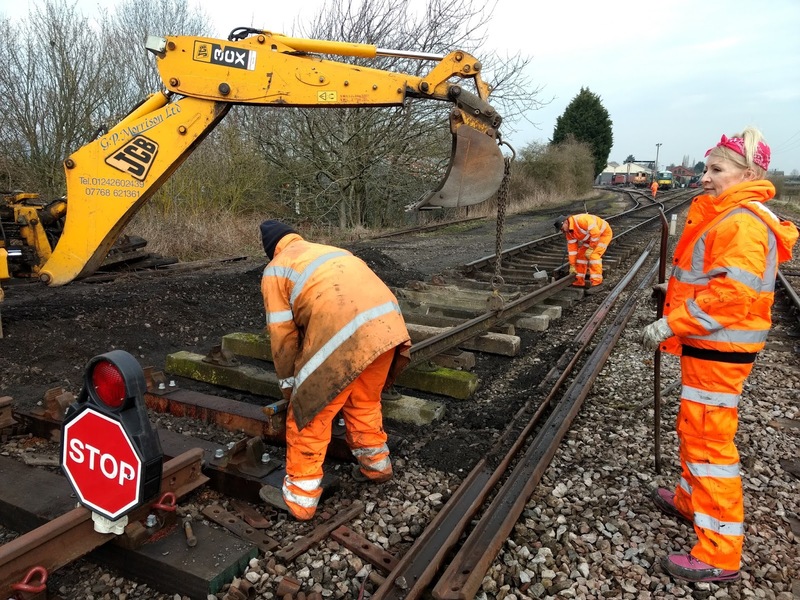 The 'works plate' was saved and handed back to us a few days ago. Here it is, back in situ. 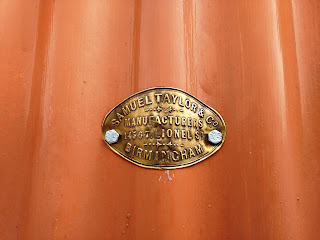 There's still a Samuel Taylor at Birmingham today, are they perhaps the same? 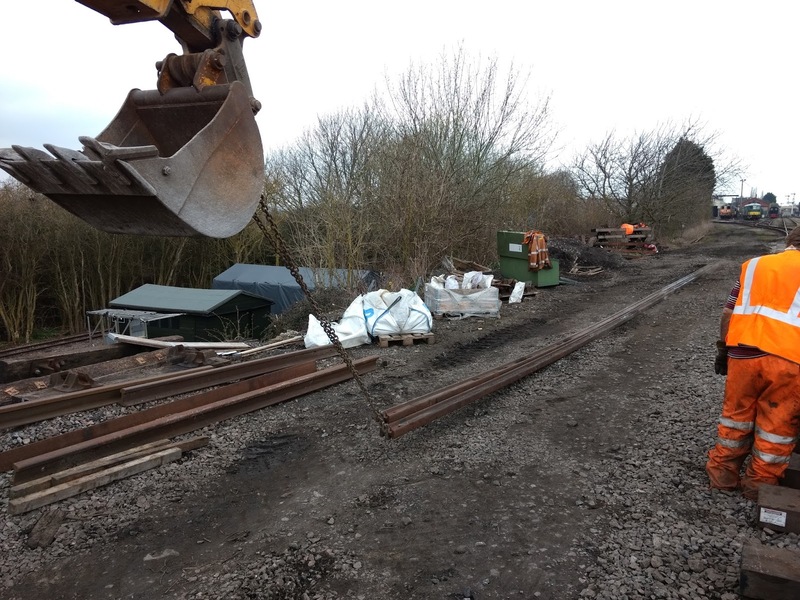 One of the two lamp huts is due to be moved to next to the footbridge tower, where it stood until the station was knocked down in 1963. On Friday - a non running day, and hence a new BAG working day - Clive and Pete were putting up the plasterboard against the ceiling of the kitchen. 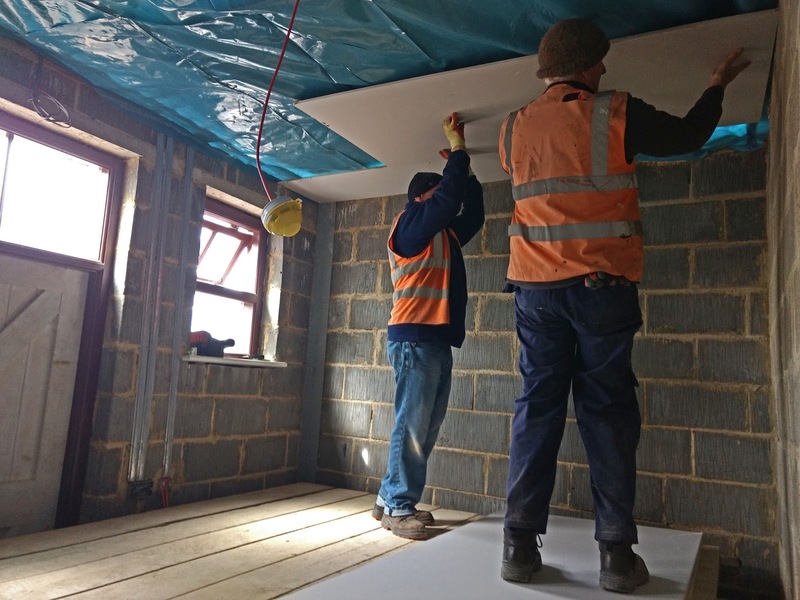 There isn't much money around at the moment - we've spent it all on the extension - so this is a low cost way of moving the cafe forward. In the week we've been open to Broadway people have been asking for one. 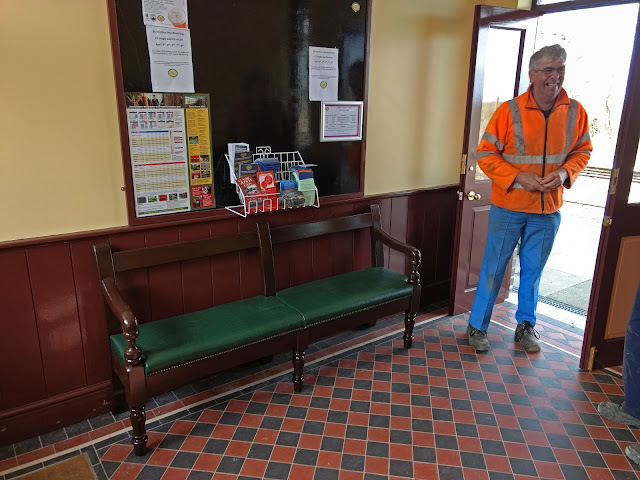 Our C&W carpenters have beautifully restored this original GWR waiting room bench. Its origin is said to be a pub opposite Swindon station, and it was heavily butchered. It only had 5 legs when acquired. Didn't they do a brilliant job? Such lovely upholstery. The same leatherette was used to restore the cockpit of a Dakota aircraft, we read on line. It fits nicely into the niche behind the doors. Thoughts are now turning toards the 'V boards' over the doors. 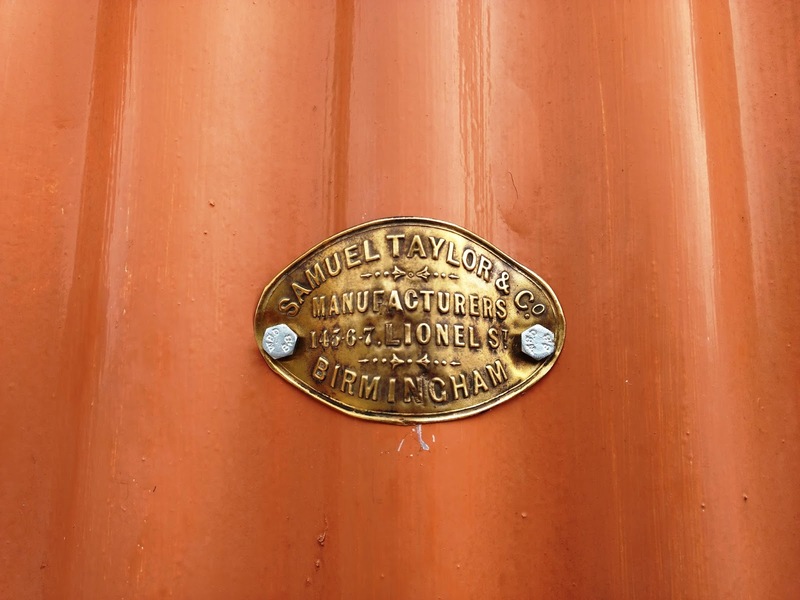 A small group of heritage enthusiasts at Broadway have been sourcing V boards at auction over the last 5 years, and a few key ones were also gifted to us. Now is the moment to sort them out. It's a tricky thing to get right. 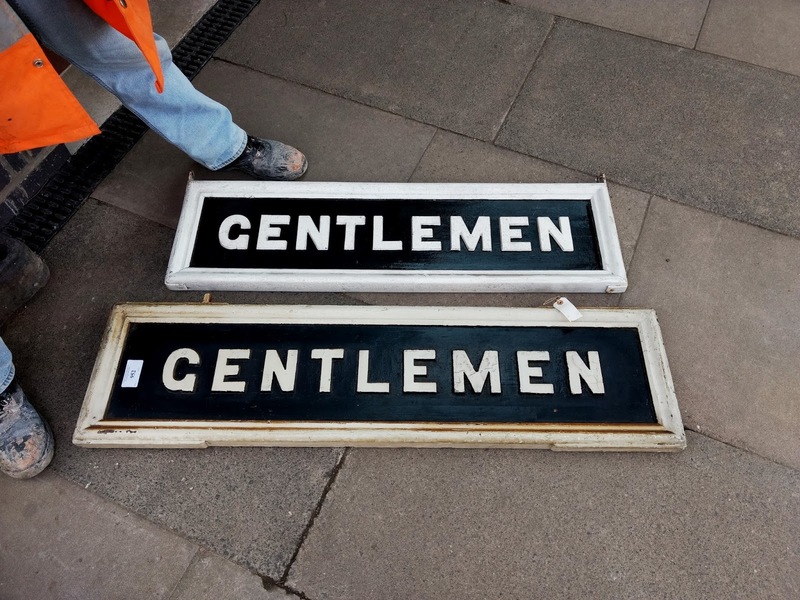 For example, the original 'GENTLEMEN' was a single sign attached to the wall of the building at the south end. That is now the kitchen entrance, and Broadway can have quite strong winds, not good for a sign attached at one end only. 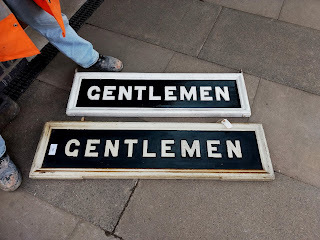 We had two such single GENTLEMEN signs, and thought about combining them to make a V board. We laid them out to compare, and found that they were different. 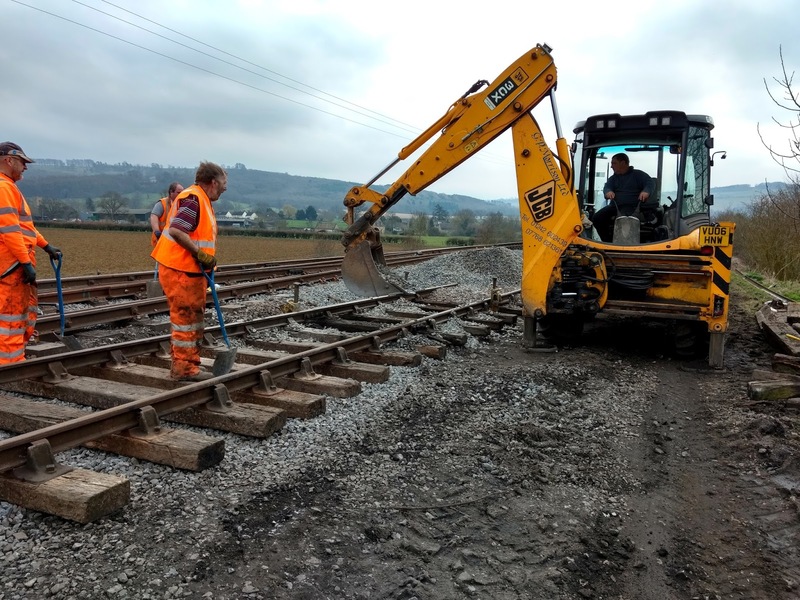 So much for standardisation on the GWR... 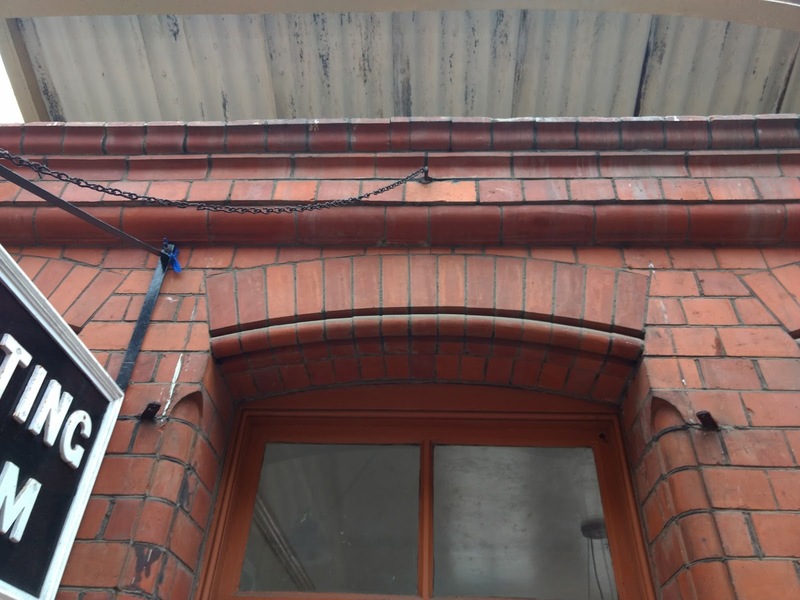 The larger one is an original bought at auction, and as the gents is now at the other end of the building we decided to use it, unaltered, suspended from the truss adjacent to the entrance, with two attachment points. 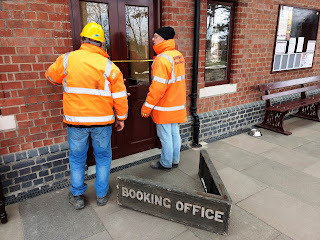 The BOOKING OFFICE V board we have on the other hand is complete. Here John and Peter are measuring up the double booking office door to see how it might fit. It needs two brackets and a rod that suspends it from the sharp end of the Vee. Peter has the skills to make this. The V board is an original, from Bletchington station. 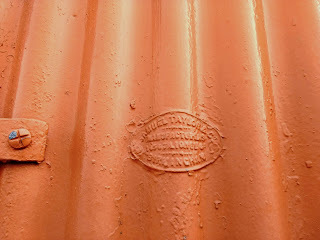 It was donated by a member who found it on the platform, while the building was being demolished. It will get a little refurb but will otherwise be used unaltered. 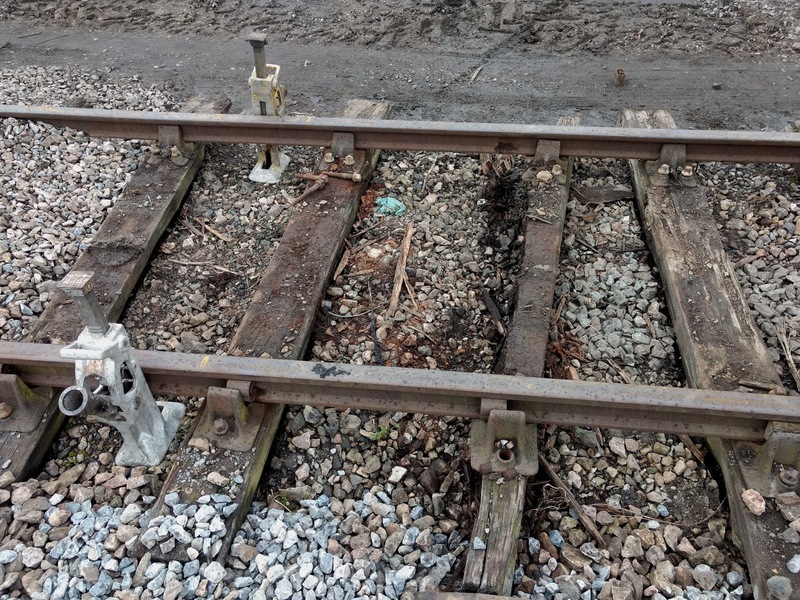 At Toddington we have the remains of the original V boards still visible. Two wall hooks L and R can be seen, as well as the anchor top centre from which the sharp end was suspended. The signage today, just visible on the left, is not authentic. The correct signage for Toddington would be this one, here photographed at Broadway after purchase at auction. In fact there are two like this at Broadway....is that an opportunity to get things right? As usual, thanks Jo for the update. 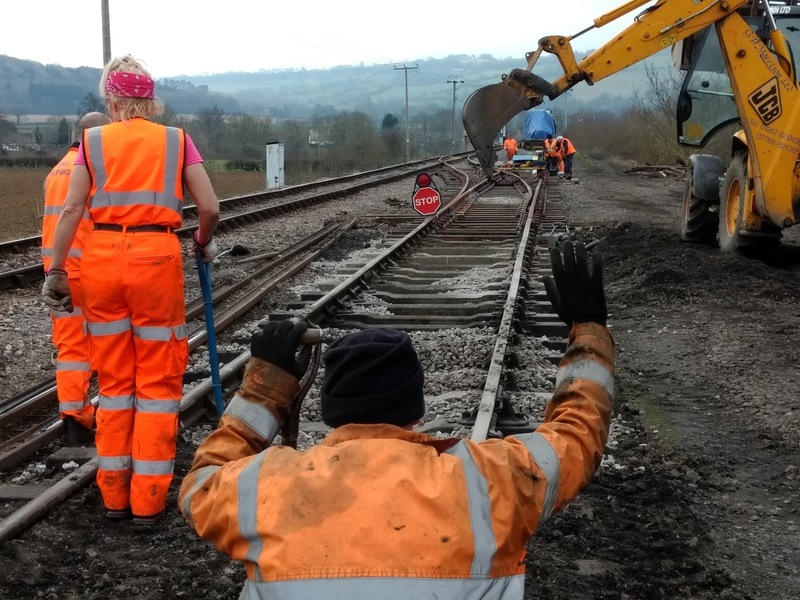 Having taken the train from Broadway to Cheltenham and return today, I really felt that the railway has taken a leap forward with Broadway opening. Going to a proper destination makes the journey seem complete and more real, although it does make one wish to continue the journey to Honeybourne, but that must wait of course! We arrived and joined a queue at the ticket office, young and old present, there were more people walking along Station Road to and from the village than I can ever remember, the train we were on was well-filled, and we bought a coffee from the buffet car. At Toddington it was good to see you track people and share a wave as you worked on the crossover. I bet it's nice feeling warmer out there for a change! I had a nice conversation with the guard as we went through the tunnel- the volunteers are all truly approachable and a credit to the line. Nice also to hear a few voices of overseas visitors, we are obviously now a key part of the Cotswolds tourist industry. 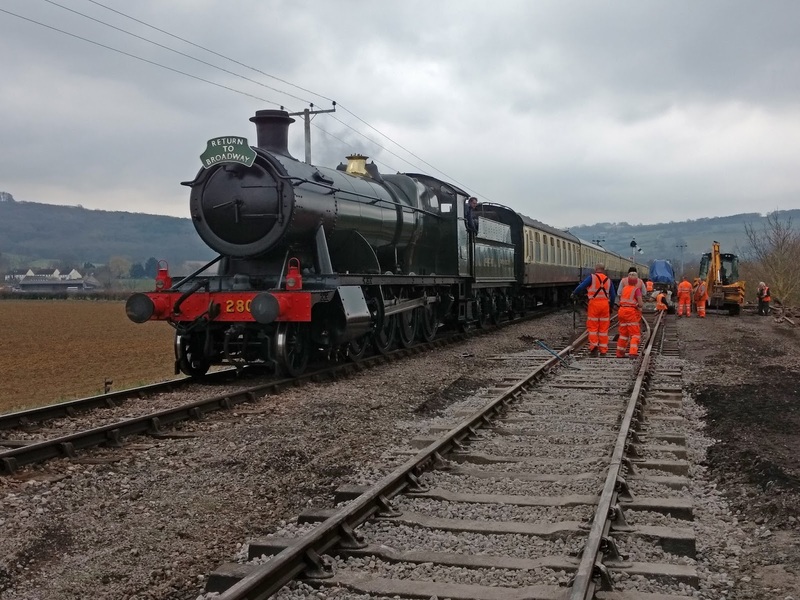 The other train hauled by 2807 crossed ours at Winchcombe with full coaches of passengers too- the Broadway effect incarnate! On return I sat on the GWR waiting room bench pictured- fantastic work! 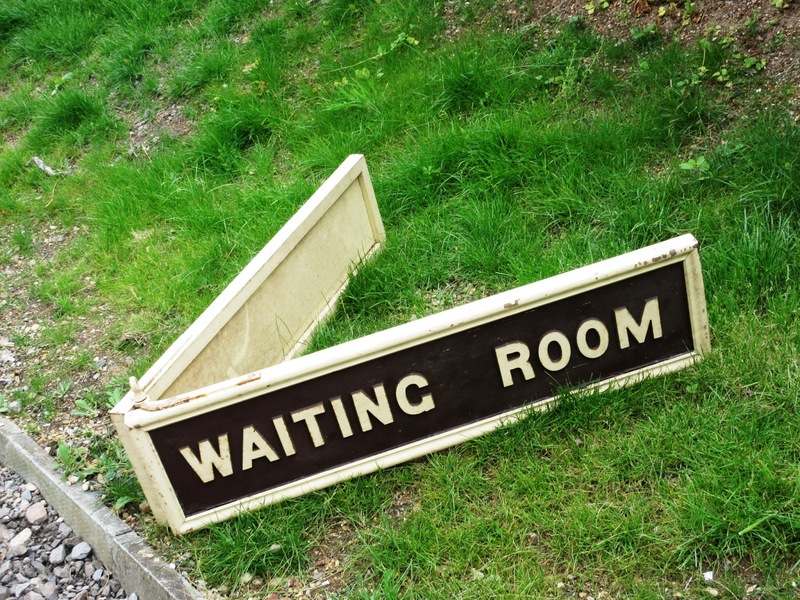 I always remember Warwick station ticket office had one like that- possibly still does. In the Crown and Trumpet pub in Broadway people on other tables were obviously also passengers from the trains, so I hope that the local businesses will be enjoying the extension of the line! All in all I was very proud to be a Member and shareholder, and give my thanks to those who volunteer regularly in all weathers. The GWSR has come of age! Well done on the work on the yard to main pointwork. The job is now nearly complete. Will S&T be champing at the bit to get the turnouts connected (electrically) to the box? Thanks for the pictures, especially of Broadway (who can - or wants to - get away from it?). The short answer would be , yes. 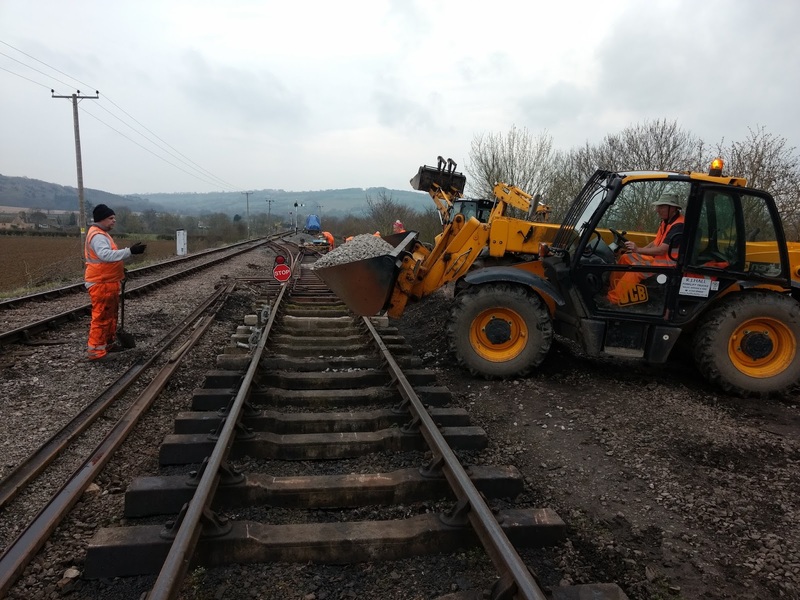 to replace the board at Toddington with a 'V' board. (It would also be nice to 'GWRify' Winchcombe! Paint would do it! Nice to have a bit of variety at Winchcombe though no? In BR western region colours it's the only station our carriages and half our locos are authentic in! Indeed, Both the NYMR and the GCR have stations that reflect the history of their respective lines. 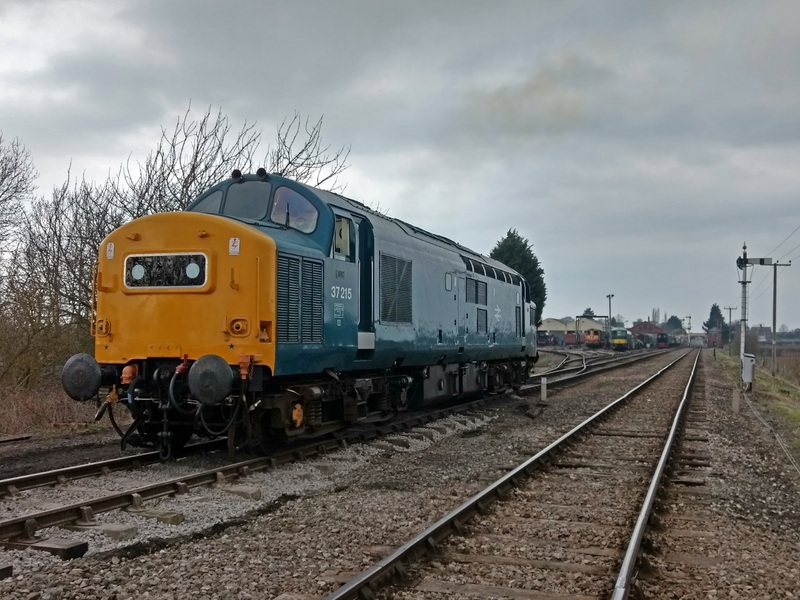 Winchcombe, in its Western Region colours (Daffodil Yellow is the correct term I believe) is a good example of the 1950s BR scheme and serves to educate our visitors. 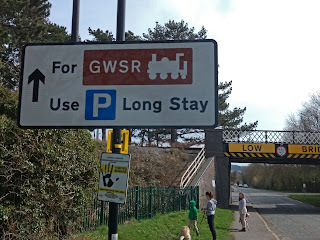 That said, GWR improvements to Toddington (such as the correct pattern signs) would enhance that station's buildings even more. what a fabulous video , well done Kate and I hope I can have a copy for my GWR talks . Jo , can you now add any new updates onto the Broadway Station Blog now that the Pway extension is finished ? Daily M.
Super work on the yard point and so fast too! I am sure I speak on behalf of all Broadway Station blog followers starved of news now it is open in thanking you for the updates. Perhaps this could be a regular feature here. 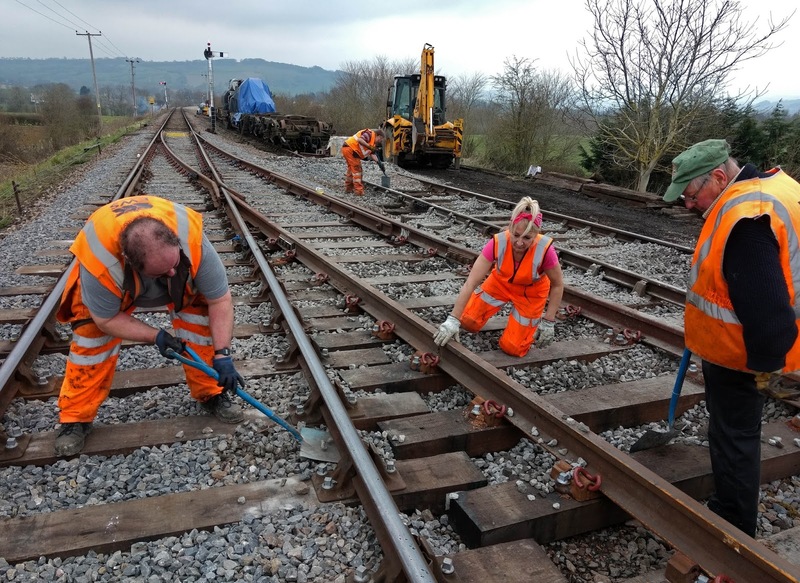 Also has any one considered a live web cam at Broadway as at Corfe and Portmadoc?